THE two warring MDC-T leaders, Nelson Chamisa and Thokozani Khupe, who are fighting over use of the opposition party's name and symbols following their acrimonious split last month, have reportedly agreed to go back to the negotiating table to resolve their differences amicably with a possibility of reuniting. MDC-T acting chairperson, Morgen Komichi yesterday seemed to suggest that he was ready for unity talks with Khupe, adding "there is unity (power) in numbers". "I said Thokozani should come back. She must comply and respect the decision of the national council and we are prepared to accommodate her, even today and continue working with her. "(Former organising secretary Abednico) Bhebhe should come and we want to work with him, (former party spokesperson) Obert Gutu must come and we want to work with him," he said. "This is not because of the judgment of judge Francis Bere, but we believe in unity, we believe in working together and that in unity, we gain a lot, while in disunity, we lose a lot. "We want unity and we want her to come on board and if she sends her emissaries to come and see us, we will welcome them and find ways of dealing with the issues and resolve them once and for all." But Khupe's deputy, Gutu, said he would only engage with the Chamisa camp if its leaders were honest and meant their words. "Our position is clear, we are not vindictive. With all the abuses, we have said we are not abusive," he said. "If our colleagues are truthful and honest, they should mean what they say and say what they mean. Their actions should reflect what they mean. "Their actions have spoken of malice, vindictiveness, intolerance, even the decision to recall Khupe from Parliament. "If they are not genuine, how can we work with them, but if they are honest, we can work together. "Everyday, I receive of 200 messages from South African numbers scolding me." The fallout between Khupe and Chamisa was triggered by the death of party founder, Morgan Tsvangirai in February this year, leaving a leadership vacuum, with both camps claiming to be the legitimate one. Komichi said after the national council resolved to expel Khupe for being defiant, Chamisa still kept the door open for negotiations with the rival camp. "We never refused to work with Khupe. She just chose to go away and that is why, even after the decision of the national council, president Chamisa never implemented it there and there," he said. "He (Chamisa), instead, established a committee of eminent people to approach her to come back to that party and continue working with others. "Actually, the president was at pains to make the decision that he made because he did not like it, he wanted a situation, whereby, the party remained united." Komichi, however, dismissed Khupe's weekend congress, claiming it had only less than 1% of the bona fide party structures. He said they were ready to publish the names of true congress delegates, so that people would judge for themselves. Turning to the High Court judgment, Komichi said the dismissal of their application would not affect Chamisa's popularity, saying it was just a minor setback similar to when former party secretary-general, Welshman Ncube parted ways with Tsvangirai in 2005. "We have no problem, this is politics and it is not a question of a name or logo, but we are going political," he said. "We have a history and past experiences of Welshman Ncube in 2005, with almost the same outcome, but we prevailed because political parties are not about names and logos, but about people following. "Leadership is about influencing the majority of the people and that attribute is found in our president Chamisa, people are following him and this is where the party is. That is what happened in 2005 and Tsvangirai prevailed. "In 1980, (former President Robert) Mugabe and (Zanu Ndonga leader, Ndabaningi) Sithole went to court over the name of Zanu and the court ruled in favour of Sithole, but the question of where Zanu people went, they followed Mugabe and that prevailed as a party since then," he said. Chamisa's spokesperson, Luke Tamborinyoka said: "We find Justice Bere's judgment political, controversial, contestable and appealable. "The party is on a roll. The court of public opinion has judged and that is why we have many people attending our rallies." Tamborinyoka reiterated that Chamisa had been open for negotiations with the Khupe faction. Party spokesperson, Tabitha Khumalo said Justice Bere did not make a ruling on the matter, but simply referred the factions to an arbitrator to settle the wrangle. She said her party remained unfazed by the determination and would continue its mobilisation exercise. "To us, it is a non-event. We are carrying on with our work. The national council gave us the resolution basing on the constitution that was amended in 2014," Khumalo said. She accused Khupe of breaking the very constitution she purported to uphold when she held her congress without following laid-down procedures. 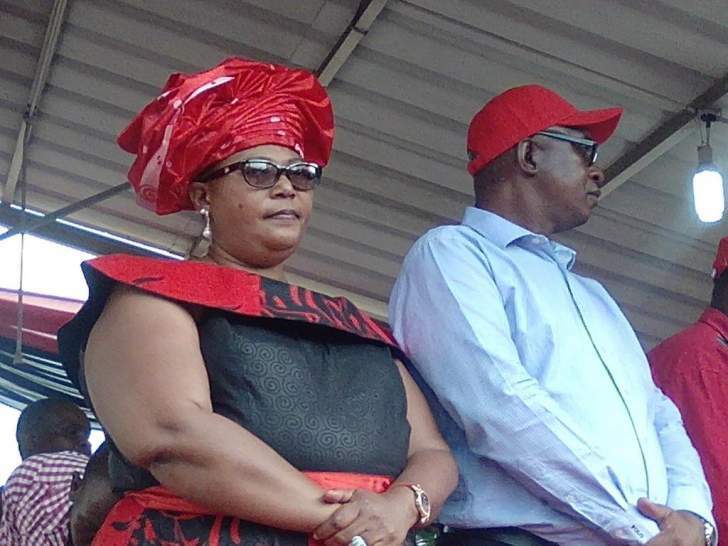 "Khupe herself is not an elected member, as she claims. She was imposed by the late leader, Morgan Tsvangirai, who barred other members from contesting her. "If she was elected, she should tell us the number of people who voted for her," she said.